There are continued repercussions from the no-knock raid that resulted in the death of a middle aged couple in Houston, and the wounding of four police officers in the gunfight the raid engendered. The raid happened on January 28, 2019. Four officers have retired as of 22 March, 2019. Dennis Tuttle was a Navy veteran. His wife, Rhogena Nicholas, was a supporter of President Trump. They had no criminal records. They were married for 20 years and lived in their modest home in Houston for the same 20 years. The police broke down their door and shot their dog. That seems to have started the gun battle. Dennis is said to have shot back, wounding the officer that shot his dog. The police claimed he was shooting a .357 magnum revolver, but no revolver was found at the scene. It seems more likely he was shooting one of the two semi-auto hunting shotguns recovered at his home. Police claim Rhogena attempted to take a shotgun from a wounded officer. She was shot and killed. It is not clear if she ever touched the officer's shotgun. The early police reports claimed Dennis continued to fight, wounding three more officers. The exact timing of events is uncertain, because no officers wore body cameras. Surveillance video from the house next door was confiscated by the police. It has been claimed a small amount of marijuana and a tiny amount of cocaine was recovered at the house. No heroin was found, or any evidence of drug dealing. As the investigation has continued, it was discovered the evidence used to justify the raid, had been falsified. Officer Gerald Goines retired Friday afternoon while under investigation following the Jan. 28 shooting deaths of two residents during a “no-knock raid” of a Pecan Park residence in south Houston. The Harris County District Attorney’s Office is reviewing more than 1,400 criminal cases that Goines worked on over the course of his 34-year career. Goines was relieved of duty as questions mounted about his actions leading up to the drug raid, in which a team of undercover narcotics officers burst into a residence at 7815 Harding St. after obtaining a no-knock search warrant. 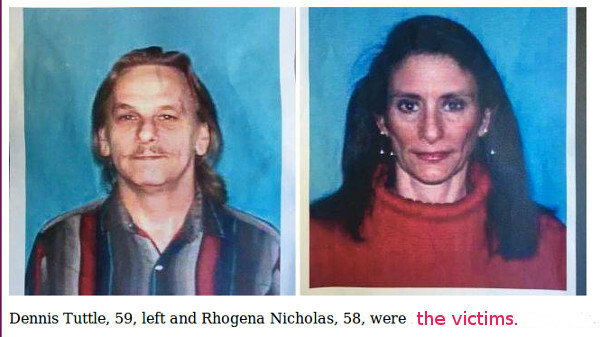 A gun battle ensued that left homeowners Dennis Tuttle and Rhogena Nicholas dead. Goines was shot, as were three other officers, one of whom remains hospitalized. All of the officers who have retired had more than 20 years with the Houston Police Department (HPD) as narcotics officers. Officer Steven O. Bryant, was listed in the warrant, HPD narcotics investigator Gerald Goines, was the lead investigator in the case, and two other unnamed HPD narcotics officers are reported to have retired as well. The Houston Police Union did not hold back after the ambush-style attack. "We are sick and tired of having targets on our back, we are sick and tired of having dirt bags trying to take our lives," said Joe Grimaldi, with the Houston Police Officers Union. "We need to have stiffer penalties on people committing crime, there's no doubt about it," said Grammas. Grammas said he would like to see mandatory death sentences for cop killers and additional officers on the street to begin to deter the violence facing officers. There was no ambush. The police fired first. It was a no-knock raid based on false evidence. There are many unanswered questions about who fired when and who hit who. The missing .357 magnum revolver remains a mystery. No handgun of any kind was recovered at the scene. That sounds a lot like a threat to anyone who dares to question the police narrative. Joe Gamaldi has been silent lately. The FBI is involved investigating this mess. There is a reasonable chance for reform, even though the FBI reputation has suffered greatly during the Mueller witch hunt. The police Chief has drastically reduced no-knock raids. Hundreds of cases done by the narcotics officers involved are being reviewed. Some pending cases have had charges dropped. One retired police officer (not involved with the Houston Police Department), told me if he were in any of those officers shoes, he would have retired if he could. It would make the pension much harder to take. Texas has a pension forfeiture law. It only applies to elected officials. It went into effect on 8 January, 2019. ©2019 by Dean Weingarten: Permission to share is granted when this notice and link are included. No Knock raids are just one of many 'Necessary Law Enforcement Tools' brought on by the War On Drugs...which war strikes me as a conspicuous failure. It has cost too much money, far too many lives, and altogether too many of our civil liberties. It needs to stop. No, I'm not saying that the drugs that are presently illegal are harmless, but the 'War' isn't stopping their sale, and IS doing additional damage to our society that we could avoid. Of course the first thing after the raid our California transplant (via Austin, TX) Police Chief did was call for gun control (again). Never let a crisis go to waste, right? What are the Severe New Zealand Gun Restrictions?